Turn back the clock to the end of July/beginning of August and imagine yourself on vacation in Door County, Wisconsin. Now, check your email and discover that one of your not-so-LYSes (Cambridge being within striking distance but not terribly convenient to Gloucester) is having their anniversary sale: 25% off all stock, 20% off special orders. No phone calls. No emails. And they stock Alchemy's Haiku, which you have suddenly become obsessed with. Ooh, kid mohair and silk. How can anyone resist? Especially in the amazing colorways they dream up out there in California. So, I email some knitting friends to see if they were going to the sale. But they've got other things to do and/or are on a yarn diet and/or don't want to deal with the chaos that is the sale. Understandable, but it doesn't help me. I decide to ignore the no calls, no emails policy and get in touch to see if they could accommodate me with five or six skeins in San Francisco Sky. They could but only by the bag, which is ten skeins. Ten skeins! What would I do with ten skeins of laceweight? Thanks, but no thanks. But then I went to sleep and woke up in the middle of the night thinking about the yarn. Which meant I had to contact them again and order the yarn. Crazy. They do, and I justify the expense (even at 20% off) by claiming it as getting-a-new-job yarn. The LYS tells me that they ordered the yarn, and Alchemy will dye it just for me. How cool is that! A few weeks later it comes in, and I have to figure out what to make with it. The skeins looked different than I expected, with a creamy white instead of light grey, but it was beautiful and luscious. I knew I wanted to do a knee-length, very simple, stockinette cardigan sort of like one I saw at a store on Newbury Street. 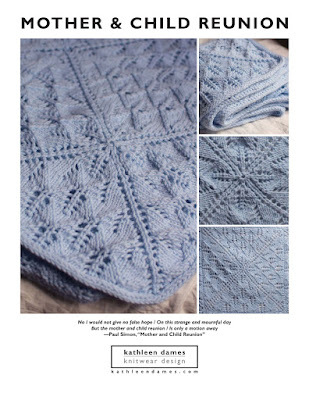 But there really aren't patterns out there for laceweight cardigans. Trust me, I looked. But I did find a top-down, raglan-sleeve cardigan pattern that I could adapt after doing the math on gauge. It's based on one by Glampyre, someone I had found online when I started to knit, so I felt this confident about it. I did a couple of gauge swatches with different needle sizes. The funny part about this swatch was that I didn't want to cut the yarn after I cast off, even though I knew I couldn't frog this yarn! I just wasn't ready to ... I don't know ... break up the set or something. The swatch was like a puff of warm air or feathers. Amazing, luxurious. After all the math I cast on and started increasing for the raglan. I'm almost to the point where I will separate for the sleeves. The best thing about top-down patterns is you can try then on as you go - particularly nice for those of us with long arms. collar or hood or nothing?